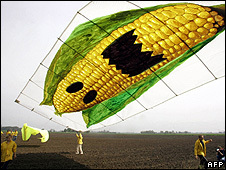 Germany is to ban the cultivation of genetically modified (GM) maize - the only GM crop widely grown in Europe. The decision, announced on Tuesday by German Agriculture Minister Ilse Aigner, is a blow to the US biotech firm Monsanto, which markets the maize. Monsanto's variety, called MON 810, is resistant to the corn borer, a moth larva which eats the stem. MON 810 is controversial in the EU. Several countries have banned it, defying the European Commission. Ms Aigner, a member of the conservative Bavaria-based Christian Social Union (CSU), said she had concluded that "there is a justifiable reason to believe that... MON 810 presents a danger to the environment". The variety has been allowed in Germany since 2005. Ms Aigner said the decision to ban it now, based on new data, was purely scientific, not political. She also said it was a specific case, and not a fundamental decision against all GM crops. In March EU governments resisted European Commission pressure to get bans on MON 810 lifted. The commission wanted Austria and Hungary to allow cultivation of MON 810. The variety is also banned in France and Greece. The UK was among a handful of countries that supported the commission's position, the AFP news agency reports. Germany was planning to sow MON 810 on just 3,600 hectares (8,892 acres) for this summer's harvest, mostly in its eastern states. Opponents of GM crops say more scientific data is needed, arguing that their long-term genetic impact on humans and wildlife could be harmful. The biotech industry says the crops are as safe as traditional varieties, and that they would provide plentiful, cheaper food.